Lily Wilson was diagnosed with cancer when she was 15 months old. In the years since, she's heard stories about the friends, family and even strangers who supported her. Now 8 and cancer-free, Lily is giving back to other "brave kids" facing cancer. Mikayla Wilson was rocking her 15-month-old daughter, Lily, when she noticed an unusual lump on the little girl's nose. "I questioned it, wondered if I should be worried," Mikayla says. The newly minted pediatrician she and her husband, Pete, took Lily to wasn't sure either and asked a colleague — an ear, nose and throat specialist — to take a look. "The ENT looked at the lump maybe 30 seconds and told us, 'If it were my kid, I'd be on my way to Mayo Clinic right now,'" Mikayla recalls. "He called an ENT he knew at Mayo, and we had an appointment scheduled the next day." The family set off for Rochester from their home in Wyoming, driving 13 hours through a blizzard to reach Mayo. There, they'd learn the lump on Lily's nose was something to be worried about indeed: rhabdomyosarcoma, a rare type of cancer that forms in soft tissue. "I touched the bump on Sunday and on Thursday it was removed and we knew it was cancer," Mikayla says, still marveling at how quickly life can change. Mayo Pediatric oncologist Carola Arndt, M.D., laid out a treatment plan for Lily. Over the next 11 months, she would have 43 rounds of chemotherapy and a month of proton beam radiation. It was a frightening time for the family. But Mikayla tells us that in the midst of that dark year, there were many bright lights. Friends, family and their community rallied around the Wilsons in many ways, including raising funds to support the cost of traveling to and from Lily's treatments in Rochester, South Dakota and Texas. Even strangers offered support. "People who didn't even know us would send cards with gas cards inside," Mikayla says. "We were so blessed. We knew that once we recovered, we wanted to give back." And they have. In the years since, the Wilsons have organized fundraisers to support other families facing cancer. Lily's gotten into the act, too. "She has a huge, giving heart," Mikayla tells us. In 2016, Lily donated her hair to Children With Hair Loss. Last year, the 8-year-old told her mom she wanted to donate books to Mayo Clinic. "A lot of times when we've been at Mayo there would be volunteers passing out books to kids and their siblings," Mikayla says. "She wanted to give to that." Mikayla put the word out to family and friends, and donations started streaming in. In January, Lily arrived at Mayo Clinic for her annual appointment and surprised Dr. Arndt with more than 40 books to share with her patients. 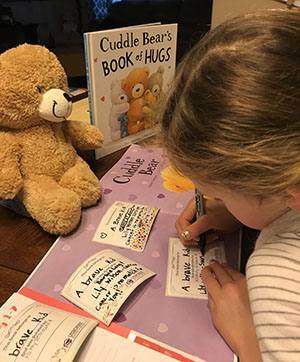 Most include a cuddly teddy bear, and all of them include a special message from Lily. "This book belongs to A Brave Kid," the message reads. "It was donated by Lily Wilson — Survivor. Cancer is no match for you!" 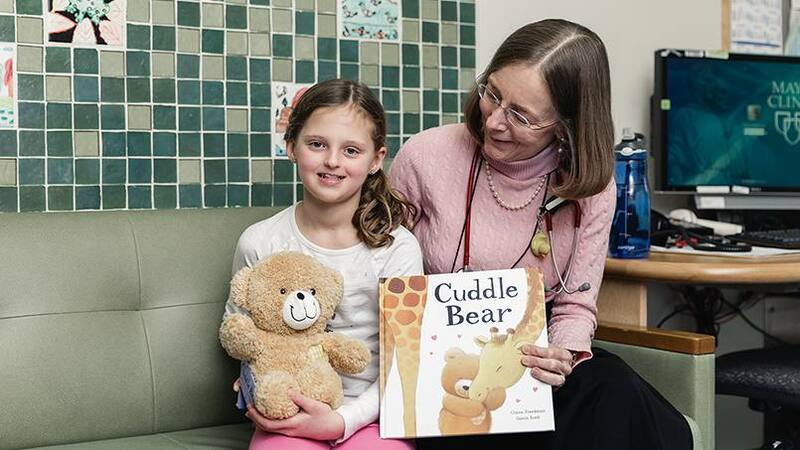 Lily even got a chance to hand deliver a book and bear to one of Dr. Arndt's patients. "Lily was grinning the entire time," Mikayla says. The donation made Dr. Arndt smile, too. "Time and time again I see that trying medical situations bring out the best in people," she tells us. "Lily is a brave, beautiful little girl, inside and out." Bring out your best by leaving a comment below before using the social media tools atop this page to share this story with others. I flew Lily and her Mom a few times to Sioux Falls for chemo. Seven years later I find my self vetted treated for cancer at the Mayo Clinic. Fortunately I have a happy ending also.